Alcohol content is the measurement of ethanol content etanolo in an alcoholic beverage. In wine constitutes an important quality parameter. 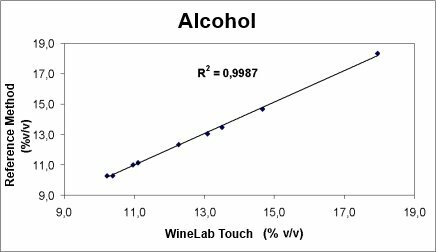 The determination of alcohol by volume with CDR WineLab® is simpler and more rapid than OIV method, OIV methods: it consists in a simple photometric reading and operates on a small sample of wine as is without any distillation. The analysis has a high repeatibility and reliable. The results you obtain with WineLab Touch are compliant with the results of OIV reference analytical methods. Time testing: one test 6 minutes. The correlation curve between the CDR WineLab® analysis method and the reference analysis method. Ethanol is oxidized in an alkaline environment through an enzymatic reaction and converted in acetic aldehyde in presence of NAD+, which in turns produces NADH. The increase of the absorbance, measured at 366 nm (end-point) is directly proportional to the concentration of ethanol in the sample. The analysis requests a rapid and simple dilution of the sample. The test is suitable for sweet wines as well, because it is able to measure up to 20% v/v. Alcohol content 0,1 – 17% vol. 0,1 0,2% vol. Alcohol by Volume was last modified: February 8th, 2019 by CDR s.r.l.